Following HORROR OF DRACULA (1958), the Lee/Drac free THE BRIDES OF DRACULA (1960) and DRACULA: PRINCE OF DARKNESS (1965), this fourth installment in Hammer's popular vampire series carries on in the studio's tradition of quality filmmaking. A year after the events of Prince, Count Dracula (Christopher Lee) remains incapacitated under a frozen stream near his mountaintop castle. 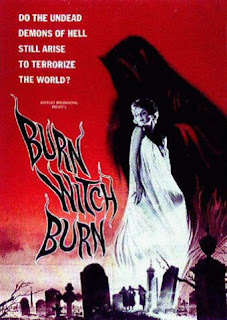 After a female victim is found dead hanging inside a church bell, villagers call in skilled Monsignor Ernst Mueller (Rupert Davies) to exorcise the castle and place a large bronze cross in front of the doorway. He, accompanied by a cowardly local priest (Ewan Hopper), ascend the mountain but end up splitting off when they get to the top. The priest accidentally slips down a rocky slope and manages to not only crack the vampire's icy tomb open, but also dribble some blood into his mouth from a head wound. Ernst carries off the exorcism and returns to his home in another town. Now revived, Dracula turns the priest into his obedient slave and heads out to get revenge for his home being desecrated. Monsignor returns to his home in Canonberg, which he shares with his widowed sister Anna (Marion Mathie) and her college student daughter Maria (the gorgeous Veronica Carlson). Maria's dating the handsome and confident Paul (Barry Andrews), who's working his way through school at a local pub/bakery, assisting owner Max (Michael Ripper) and barmaid Zena (Barbara Ewing). Maria's uncle shuns Paul for being an atheist, but the two will soon have to move past their differences once the evil count arrives in town, secretly takes refuge in the bakery's cellar and plots to turn Maria into his vampire bride. Terence Fisher was originally slated to direct this entry too, as he'd done all three of the previous entries, but was involved in a car accident right before filming and had to be replaced. The good news is that Francis does an equally fine job at the helm here and his film is every bit as good - and in some ways even better - than the three films preceding it. The studio's solid production team - cinematographer Arthur Grant, composer James Bernard, production designer Bernard Robinson, etc. - is still in place, doing typically fine work all, and there's no weak link in the entire cast. There's also some effective matte work here, with scenes of characters hiking up through mountains and walking on rooftops and ledges high above the village that give this a pleasingly gradiose fantasy-movie feel. Writer Anthony Hinds (using the name "John Elder") provides good dialogue and characterization to ensure the leads are relatable and likable. What might irk some viewers out there (aside from Lee being in a smaller supporting role with little actual dialogue) is that the film doesn't entirely stick with the usual vampire folklore. The count casts a reflection (seen in water at the beginning), a stake to the heart doesn't take him down and prayer - at least in part - is used to defeat him. 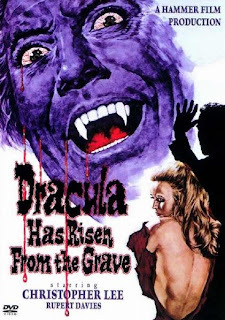 Risen would go on to become Hammer's most profitable film, leading to five more entries in the Dracula series: SCARS OF DRACULA (1970), TASTE THE BLOOD OF DRACULA (1970), DRACULA AD 1972 (1972), THE SATANIC RITES OF DRACULA (1973) and THE LEGEND OF THE SEVEN GOLDEN VAMPIRES (1974), as well as many other unrelated vampire films. Crucial title in the Italian horror canon, and normally considered the very first giallo, Girl is a pulp murder-mystery, a bit lighthearted and romantic at its core, with scenic Italian locations as a backdrop and absolutely stunning black-and-white cinematography from the director. American tourist Nora Davis (blonde, wide-eyed Leticia Roman) finds herself accidentally associating with a drug smuggler aboard a plane. The man is immediately arrested once they arrive at the Rome airport and Nora, avoiding implication, goes off to stay with her ill great aunt Edith. She briefly meets her aunt's handsome doctor Marcello Bassi (John Saxon) that evening, who advises her about what to do in case of an emergency, and later than night Edith passes away. Nora stumbles into a vacant city square and runs into a mugger, who swipes her purse and knocks her to the ground. She hits her head, gets a concusion and through foggy eyes thinks she witnesses a woman being murdered. Talk about having a bad day! Because of the attack, the head trauma, a rainstorm that conveniently washes all the blood away and no murder weapon or corpse turning up, Nora finds herself in a very Hitchcockian situation where nobody believes her about what she saw. After a short stint in the hospital, she goes to her aunt's funeral and meets a friendly, wealthy middle aged woman named Laura (Valentina Cortese) who offers to let her housesit while she's out of the country visiting her husband (Giovanni Di Benedetto). Laura's home just so happens to be right across from where the Nora saw the murder, so our intrigued, mystery novel loving heroine decides to stay there and try to get to the bottom of things. She finds some newspaper clippings detailing a series of murders commited ten years ago referred to as "The Alphabet Murders" by the press (the three victims had last names beginning with A, B and C) that occured right where she's staying... ten years ago. Will a similar fate befall Ms. Davis? It took six people (including Bava, Bruno Corbucci and Franco Prosperi) to write a script that's muddled, extremely far-fetched, a bit skimpy on characterization and saddled with a disappointingly predictable resolution. In strictly visual terms, however, it's an exciting and arresting piece of work, with a breezy air throughout punctuated with some very nicely executed moments of suspense and terror. 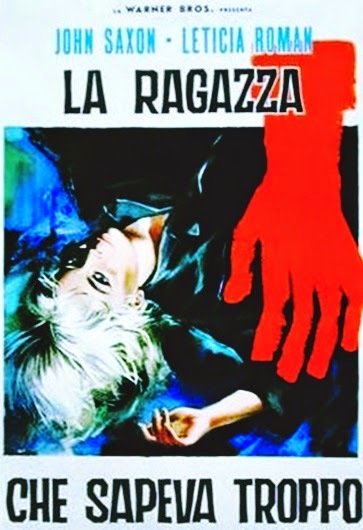 It also deserves credit - along with Bava's BLOOD AND BLACK LACE (1964) - for helping to shape a subgenre that would become very popular toward the end of the decade in Europe. There's also a great, recurring jazzy theme song ("Furore") by Adriano Celentano and Paolo Vivarelli. Dante DiPaolo, Milo Quesada, Gustavo De Nardo and Franco Ressel co-star. When originally released to the U.S. (titled The Evil Eye), it was dubbed, all references to marijuana were removed and the horror scenes were trimmed to focus more attention on the travelogue and romantic elements. The 2007 Anchor Bay DVD release is the original Italian-language cut.